Welcome to the Games section. Payoff Pitch Baseball uses a unique Pitcher – Batter interface to resolve each at-bat. Click on the image above to view samples of the player cards and a short description of how the game works. 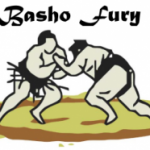 Basho Fury is a quick playing simulation of the sport of Sumo. The game is played with a pair of standard six-sided dice and the game parts.